Rain. Gray. Rivers rising. Mud everywhere. Vitamin-D low. Worries high. A typical Thursday. Samuel is God’s reward to Hannah for her prayers. Then she gives him up to the Temple. Before taking him to the Temple, Hannah has time one-on-one with Samuel, her first son, evidence that God heard her prayer. She retains him in the home until he is weaned. In the 10 months that I have been a dad, my connection to my daughter has become irreversibly strong. I cannot remember life BA–before Anna. I cannot begin to fathom the emotional roller-coaster that had to have been Hannah’s year with Samuel. God’s answer to her prayer is in her arms, yet she knows that she is a woman of her word–and will ‘lend’ Samuel to the Lord. Samuel is not Hannah’s, and he’ll never ‘be his own man’. He’ll always be God’s. I fight this distinction. Not by trying to be something else, but by downplaying that my life belongs to God. This must be my greatest temptation: to think I am my own. I have wanted to recapture the playfulness of the Lent of my college-days. But I’ve matured, and so too should my observance of this High Holy Season. An iniquity has been identified…now my knowledge necessitates action: submit to God. 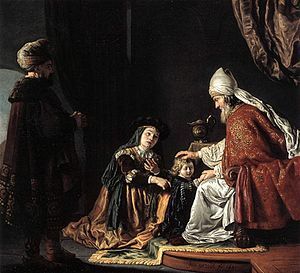 Samuel is born at a time when Israel had fallen to corruption. A child dedicated to God at that point in history was in store for a difficult task. The priesthood needed redeemed. The nation was tattered after the failings of the judges. The people were crying out for better leadership…but God was not keen on their plan. The road to Exile was being paved right before Eli’s failing eyes. The dedication of the leader does not guarantee the faithfulness of the people. Lent is about the dedication…which must continue regardless of one’s feelings about it. I continued driving the speed limit and read about Samuel. Really need to eat better.